Each project should be individually assessed in conjunction with your arts practitioner to ensure the safety of students and that the desired outcome is achieved. 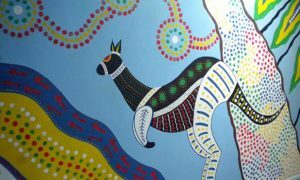 We can hold a competition or workshop and design the mural as a collective. In this scenario, the children to lead the design process (usually with guidelines from the teachers) and then create a mural design from their ideas. The design is then ‘finalised’ and painted it for you. The main advantages of this are it looks professional and finished, but the children get to be part of a collaborative process, seeing their ideas developed and come to life. There are no children having access to paints, so no problems with allergies etc. This one was designed with the help of kangaroo class. We can run a competition where the children design various elements of the mural, these are then judged and the winner’s designs would be incorporated into a mural (pretty much as they have drawn them). In this case, we would normally include elements not designed by the children for the purposes of presenting a finished piece. The winners can also be involved in the painting of the mural if location allows and we can provide certificates for the winning entries. This example is exactly that, the tree has white circles which house the designs of the winners and runners up. 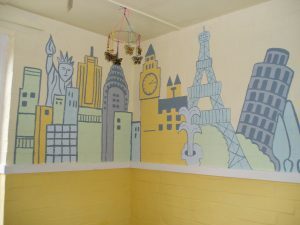 We can design a mural where every child has the opportunity to add their mark into the mural. So younger ones can add a hand print, older ones can add flowers or something similar. Clearly the finished mural will have a different look but, that is sometimes the desired effect. 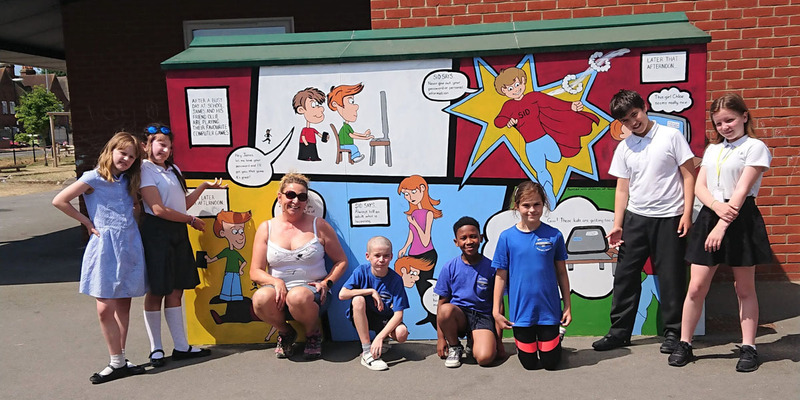 This mural was created by a group of 8-11 year olds with very different abilities, but the simple colour palette and guidance has produced a coherent mural. Lastly, we can either hold a competition or create a design and the winners will actually paint the mural with me under supervision. This usually works better when the children are 8 years and above. Children will need to be dressed appropriately, and will paint in small groups with additional supervision from school staff. This one involved them just filling in coloured areas with plain paint. Lines can be redefined where necessary. Location of the mural, clearly if ladders/scaffolding is required, then including children in the painting process is compromised. 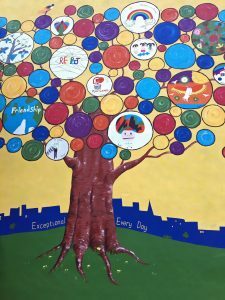 Whether you want the finished mural to have a childlike feel or more of a finished piece (there is value in both), I attach examples of alltogether with some notes we have recently put together around murals in schools which may help you to come to some decisions. Cost wise, there isn’t a huge amount of difference. I have to charge for visiting the school to judge a competition/hold a workshop, but the mural takes longer to paint when I am supervising students painting, so the two offset each other to some extent. As a guide price, you are looking at around £35-50 per sq. m. depending on the complexity of the design and the surface to be painted. This is fully inclusive of all materials, travel etc. Only scaffolding/access needs to be added if required. I carry out a risk assessment before painting within a school premises. The schools safeguarding policy will be adhered to and a copy of my own safeguarding policy is available on request. All quotations and designs are produced free of charge and without obligation. I hold £5 million public liability insurance and am DBS cleared, however if the school wishes to carry out it’s own DBS clearance, they will be supported.